Editor’s note: After confusion between the two Blackboard apps mentioned in this article, it has been edited for better clarity. The Gannon Knight apologizes for any inconvenience. 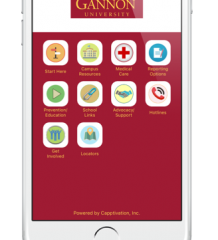 Gannon University students can access grades and course content quicker and stay organized with their choice of the Blackboard Mobile Learn application or the Blackboard Student app, but few students are aware of the mobile services Blackboard offers. Often mistaken for its new version, Blackboard Student app, the original Learn app is much simpler and easier to operate when you need to quickly retrieve something for a class. This app allows students to check their grades, keep track of assignments due, quickly view a course’s syllabus or browse the course’s content and makes emailing classmates and teachers easier. Another feature that many students have come to appreciate is the personalization that this app allows. Students are given the option to change the name, color and order of their courses. This is a useful feature that may help students remain organized. In addition to visually personalizing, students have the option to change the notification settings. If you are a student who likes to work ahead, you may choose to change the settings to notify you that a professor has added something to the course’s content folder. Isabelle Amann, a junior early childhood development and education major, is one of the few students who knows about – and uses – the Learn app. Lauren Taylor, senior marketing manager for Blackboard Inc., said Learn was designed in 2011 and the company updates its apps at least once a month. In addition to the monthly updates, Blackboard Inc. frequently adds new features. Nicholas Sorensen, a junior communications major, is one of the many students who were not aware of the app; therefore, he has not had the chance to use it. He said that he regularly checks his Blackboard account at least once or twice a week – depending on his class assignments and posts. “I would give the app a shot, but I think it may be a little challenging to post assignments through it,” Sorensen said. MC Gensheimer, co-director of the School of Communication and the Arts and an assistant professor in the department, uses her Blackboard account about three times a week. “I think that anything that allows for mobile communicating is valuable,” Gensheimer said. Blackboard recently announced that they would be discontinuing support for their Blackboard Mobile app later in 2017 now that they've released their Bb Student app and will shortly release their Bb Instructor app.